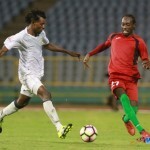 In the build-up to last night’s international friendly, Trinidad and Tobago National Senior Team coach Stephen Hart challenged his players to assert themselves at home and set a standard for football visitors at the Hasely Crawford Stadium. 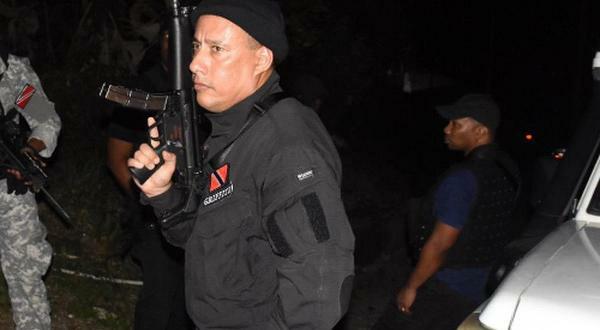 But, in the end, it was the stretcher bearers who saw the most action as the “Soca Warriors” and Nicaragua played to a largely dull goalless draw in Port of Spain. 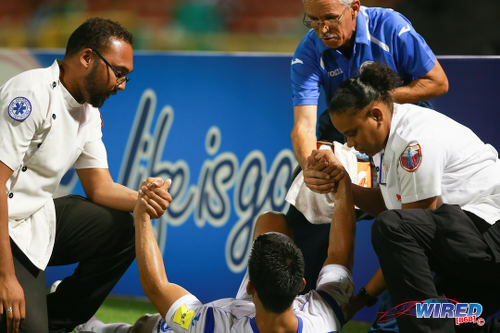 Photo: Stretcher bearers attend to a Nicaragua player during friendly international action against Trinidad and Tobago yesterday in Port of Spain. Hart, who extended his unbeaten run in regulation time to seven games, was happy to look for the positives, though. Only Hart would know how much of his positivity was genuine. In truth, the Warriors had a wonderful opportunity to show their offensive capabilities against organised but limited opponents. And, at best, Nicaragua goalkeeper Justo Lorente looked to be in trouble just twice. Warrior fans with long memories know what it means to dominate opponents and that was not it. 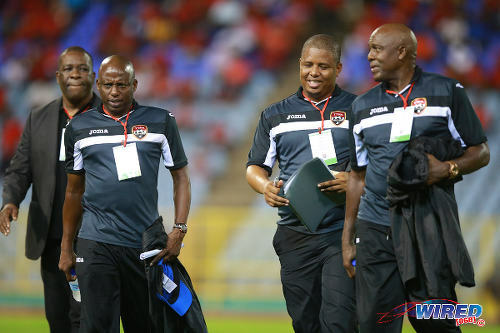 Photo: Trinidad and Tobago National Senior Team technical staff members (from right) Michael “Brow” Maurice, Derek King, Hutson “Barber” Charles and William Wallace exchange ideas before kick off last night against Nicaragua. There was no doubting the sincerity of Nicaragua coach Henry Duarte’s pleasure with the result, though. Last night was Nicaragua’s ninth game under Duarte, a Costa Rican native, and they have lost just once with six wins against Anguilla (twice), Suriname (twice), Jamaica and Cuba. “Within a couple of years, Nicaragua will be a team to be reckoned with,” said Duarte. The Warriors do not have the luxury of time, not where their Russia 2018 World Cup dreams are concerned. Ironically, if there were disappointed supporters yesterday, it was because the Warriors have made a habit of overachieving when it mattered. Yesterday was a reality check. Hart’s troops are still a work in progress. They are spiky, defiant and athletic. But they are not expressive, creative and domineering. The first blow to the squad’s ego might have been delivered at 7 pm as roughly 2,500 people came out to see the Warriors kick off against Nicaragua. The number of supporters doubled by halftime but, in a venue built to accommodate 22,000 supporters, the attendance still seemed scant respect for the efforts of the young men. Regardless, the Warriors started brightly and should have scored after just three minutes as playmaker Keron “Ball Pest” Cummings crossed from the left flank for full back Aubrey David whose close range shot was denied by Lorente while Khaleem Hyland and Trevin Caesar both failed to bury the rebound. Photo: Trinidad and Tobago playmaker Keron “Ball Pest” Cummings (centre) tries to find space between the lines against Nicaragua last night in Port of Spain. Joevin Jones whistled a free kick narrowly wide, three minutes later, but, largely, the Warriors struggled to get their rhythm against Central American opponents who closed passing lanes quickly. The boys in red shirts dished out more turnovers than a server at Linda’s Bakery. 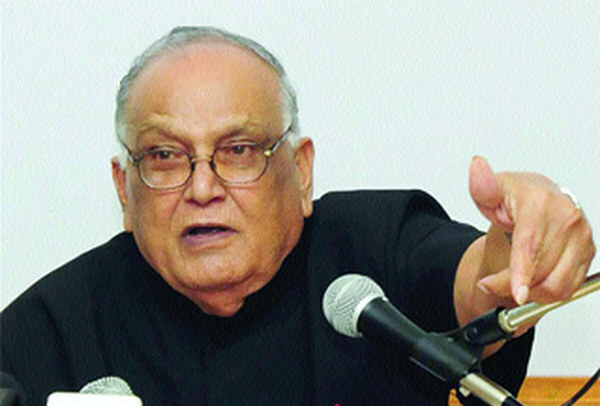 But Nicaragua had neither the guile nor the explosiveness to capitalise. Credit is due here to the composure and athleticism of the Trinidad and Tobago back four, which was superbly shielded by midfield ball winner Kevan George. But the football fans had hoped for more against a team that was already eliminated from the World Cup qualifying series, albeit by the most slender of margins against 2015 CONCACAF Gold Cup finalists, Jamaica. Trinidad and Tobago were better in the second half, although it was near impossible to be worse. 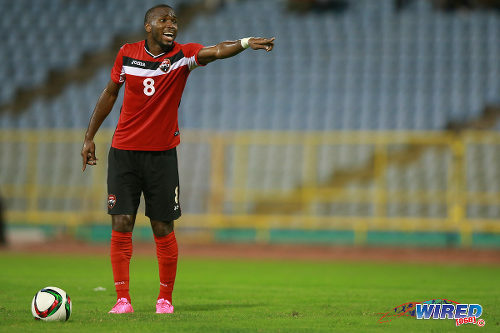 Photo: Trinidad and Tobago midfielder Khaleem Hyland points the way during last night’s friendly international against Nicaragua. Yet, chances remained at a premium. Cummings, who had one of his quietest showings in “Red, Black and White”, hit one presentable chance off the body of captain Kenwyne Jones in the 59th minute. And Cummings opted to go alone in the 62nd minute but only gave Lorente catching practice while the Joneses pleaded for a cross inside the area. The Nicaraguans were beginning to tire by then and the flow of the game was repeatedly broken by substitutions or players seeking medical attention. There was no doubting the seriousness of the Warrior captain’s injury in the 73rd minute, though, as he was stretchered straight into the dressing room after a collision with the opposing goalkeeper. Hart said there will be x-rays on the giant forward’s shinbone to assess the damage. Jones (K) has scored 33 percent of the Warriors’ goals over the past two years. And, almost certainly, Guatemala would breathe easier if the Cardiff City forward does not travel to Guatemala City for their qualifier on November 13. Radanfah Abu Bakr got the ball in the back of the net in the 88th minute but his item was immediately ruled out for a foul by defensive partner, Sheldon Bateau, on the opposing goalkeeper, after lively teenaged substitute, Aikim Andrews, had sent a looping header towards the far post. Andrews created two good shooting opportunities for himself too but failed to hit the target while fellow substitute, Jonathan Glenn, could not reach his incisive low cross in stoppage time. 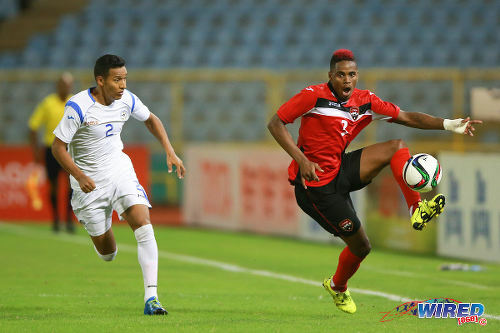 Photo: Trinidad and Tobago winger Joevin Jones (right) tormented Nicaragua right back Joseue Quijano last night but could not create a winner for the hosts at the Hasely Crawford Stadium. It sounded like a generous assessment of a largely uninspiring affair. “The most important 30 minutes of a manager’s week is his press conference,” former Liverpool manager Gerald Houllier once said, “because it is watched, listened to and read by supporters, directors and players. The next time Hart sees his players, there will be three World Cup qualifying points at stake. In the interim, supporters and potential sponsors still need to be wooed. Was Hart reporting what he saw? Or what he wants us to see? 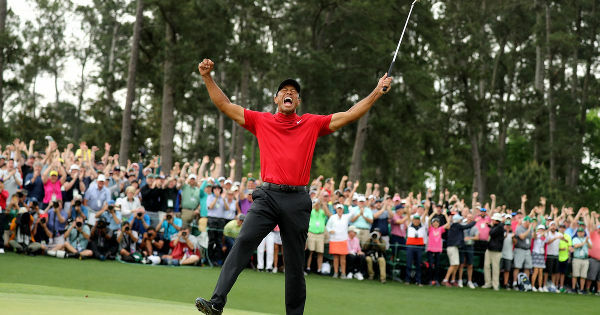 Thus far, Trinidad and Tobago’s competitive record under Hart—eight wins and just one regulation time defeat from 15 outings—suggests a man who knows what he is doing. 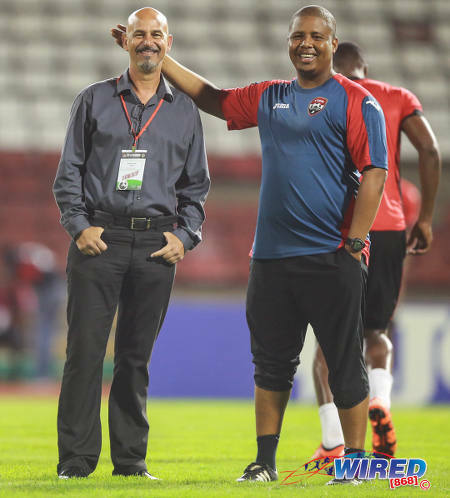 Photo: Trinidad and Tobago National Senior Team coach Stephen Hart (left) enjoys a light moment with assistant coach Derek King before kick off against Nicaragua in Port of Spain. Just over a decade ago, the Warriors were stacked with shifty little ball players and swaggering conductors like Russell Latapy, Dwight Yorke, David Nakhid, Arnold Dwarika, Kerwin Jemmott and Aurtis Whitley. These days, it is the gladiators like Jones (K), Bateau, Hyland, Abu Bakr and Andre Boucaud who set the pace for the Trinidad and Tobago football team. Movie Towne is just a stone’s throw from the Hasely Crawford Stadium but they might as well exist in parallel universes. For much of last night, Trinidad and Tobago’s play was as entertaining as watching a construction crew smash rocks. Yet, many impressive buildings started that way. Photo: Stern John (second from right) celebrates with goal scorer Dennis Lawrence (centre), Kenwyne Jones (far right), Aurtis Whitley (second from left) and Cyd Gray after going ahead against Bahrain on November 16, 2005. Warrior fans will have to trust Hart’s blueprint a bit longer. Trinidad and Tobago (4-2-3-1): 21.Jan-Michael Williams (GK); 23.Daneil Cyrus, 18.Yohance Marshall (6.Radanfah Abu Bakr 57), 4.Sheldon Bateau, 2.Aubrey David (17.Mekeil Williams 68); 19.Kevan George, 8.Khaleem Hyland; 11.Trevin Caesar (13.Aikim Andrews 78), 20.Keron Cummings (14.Andre Boucaud 67), 3.Joevin Jones; 9.Kenwyne Jones (captain) (7.Jonathan Glenn 73). Unused substitutes: 1.Marvin Phillip (GK), 10.Willis Plaza, 15.Neveal Hackshaw. Nicaragua (4-2-3-1): 1.Justo Lorente (GK); 2.Joseue Quijana, 4.Oscar Lopez, 6.Luis Copete (20.Axel Silva 81), 3.Manuel Rosas; 5.Luis Peralta, 8.Marlon Lopez (14.Jason Coronel 86); 7.Carlos Chavarria (15.Carlos Membreno 90), 11.Juan Barrera (captain), 10.Elvis Figueroa (13.Bryan Garcia 68); 9.Raul Legias (18.Eulises Pavon 77). Unused substitutes: 12.Diedrich Tellez (GK), 16.Daniel Reyes, 17.Erick Javier, 19.Jessie Lopez. 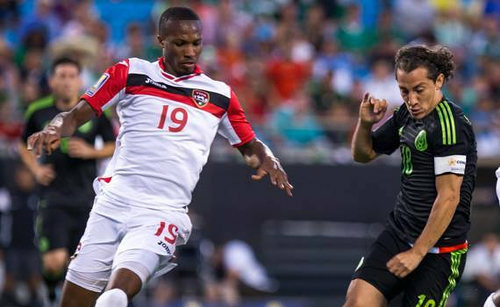 Photo: Trinidad and Tobago midfielder Kevan George (left) keeps an eye on Mexico captain Andres Guardado in 2015 CONCACAF Gold Cup action. 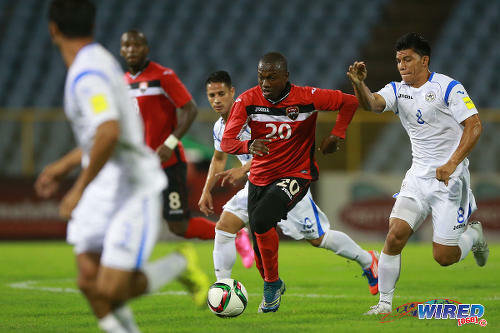 Trinidad and Tobago 0, Nicaragua 0 at Hasely Crawford Stadium. Not yet. Sometimes there is protocol to follow in these matters as some clubs don’t appreciate the health of their players being broadcasted either. But will see what the word is later today. 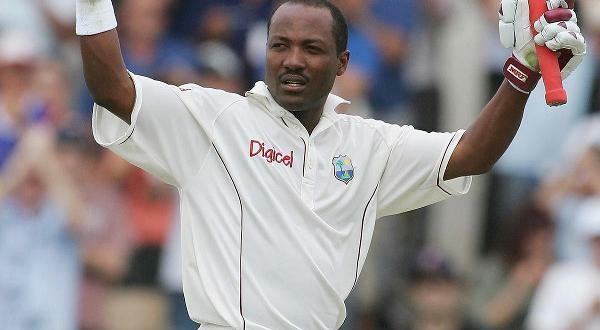 Concerned about Kenwyn…..any new updates Lassana? Decent result. Liked hustle up front. Hoping for more sustained ball possession and midfield creativity going forward. Should we be worried, a lot of us are kenwin biggest critics but with him and hart we have been getting results. That’s sign of a good leader. With Hart we have been getting the results….. I find the team played better wen Kenwyne came off….. I think the team is almost built to play with Kenwyne. So I don’t think they are better off without him at all. Direct and long whenever possible with particular attention to crosses and set pieces. 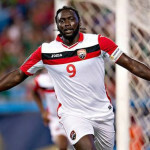 Kenwyne has 14 goals in his last 25 games for Trinidad and Tobago. If that doesn’t justify his starting position, then I don’t know what will. You have to take those 14 goals in context….for eg. Stern had an impressive strike rate fir TnT as oppose to Dwight as well as many other int’l for their country….but if his overall game is satisfactory for Lasana Liburd, I take note…. His goal scoring ratio is not truly reflective of his performances! I agree that your scoring rate isn’t always reflective of your performances. But it reflects your effectiveness where it counts though. 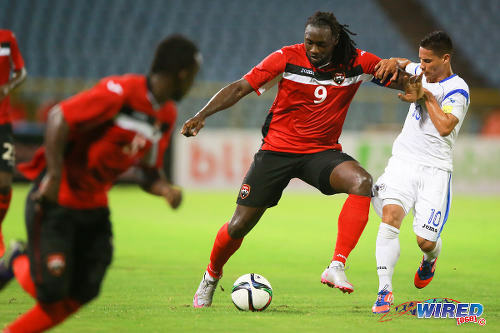 Trinidad and Tobago just doesn’t have many offensive weapons to scare opposing teams anymore. Kenwyne Jones with his gigantic frame is one. I wish he did more. But what he does helps. I thought the game wasn’t of the best quality. Nicaragua looked horrible they have work to do on the free kicks. The official seemed to be fooled by the Nicaraguans more often than not. T&T isn’t a bad team. I like J. Jones and Kevan George. It’s a credit to Kevan George that he can give consistent quality performances for the national team despite the lack of playing time at his club. On that note, I wonder what Jonathan Glenn and Trevin Caesar will be doing over the next month since their leagues have ended? Very good question. God forbid we have Kenwyne injured too. But chances are he would have recovered by then. Kevan really brings one thing only to the team though. He isn’t very good with the ball on his feet. But he breaks things up for fun. Breaking up plays is definitely needed. See how our wing backs were heavily exposed by Panama in the second half? I thought Gavin Hoyte was badly exposed in the first half too. Thankfully we have central defenders with some aerial ability and solid goalkeepers. Joevin is sometimes slow to help out too. That’s one thing I appreciate Cato for because he works hard. Also we need the clock to do a bit more than show the score and the flag. It needs to be updated with substitutions and injury time. Last night I swore the visitors watch the grass and saw a pool. Smh. However, while we had greater ball possession and played better than the visitors, we have work to do. We need tighter ball possession and passing, more creativity and we need that killer instinct to finish. I saw times when the person with the ball could have taken a shot. Instead they turning around looking to pass. I saw the ball cross the face of the goal and nobody was there to lend a head, chest or foot to tip it into the net. Maybe I watch too much BPL or UEFA football but I expect the Soca Warriors to do better. Nicaragua looked like the lesser team last night yet we couldn’t finish. The one goal in the 88th felt like we pull real teeth to get it then it was disallowed. I also felt like we only woke up at the 90th minute. Shin injury…not broken but he’s in a lot of pain! Thanks Cherisse Moe. Good thing it isn’t broken. And that is definitely a painful area. Yh…he said he was kicked when he fell which made it worse. He went hospital last night. Got a morphine shot..His shin is banded up. He’s on crutches n in real pain..
Not a good result from the standpoint that 1. Nicaragua is ranked 95th, 2. We were at home, needing to give the local fans a taste of the rhythm and momentum that we have shown in our play abroad and, 3. We failed to grip into what Hart had summoned when he addressed the need to establish and communicate home-ground Warrior resolve and vanguard mentality to all up-coming not, “visitors” but, eager and calculating predators. There might be a very small positive-takeaway in that we have some reality checking to do based on this “fall” – as we have come to know, we learn more and best from the disappointments of not achieving what we expect, especially the ones that seem more ready to accomplish. A small other positive is, Nicaragua has had substantial results undefeated in six of seven immediately preceding games that included Jamaica in Jamaica, and, Cuba, two formidable T&T rivals. My closing thought is that given our away performances and results, we could take some solace in the up-coming Qualifying game at Guatemala on November 13 – even when we know they are going to be positively charged. 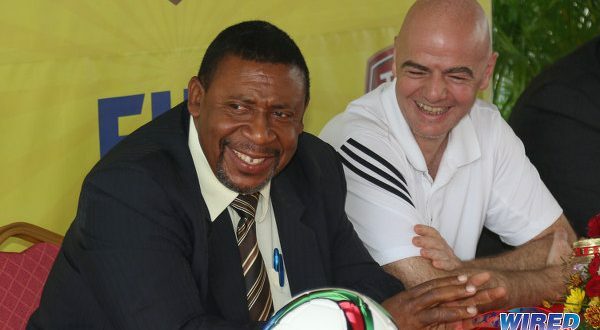 Further, we must pay gripping attention to the fact that our next game, 4 days thereafter, is against our nemesis, the US, in T&T (not proven to be an advantage as it is with formidable teams) and who, themselves, are needing to reestablish their “supremacy” under a near-narcissist coach. The US needs to play better, get better results and, an opening home game to their 2018 Qualification campaign against, St. Vincent and the Grenadines, and away to somewhat-struggling, home-playing T&T, may be seen as providing the best start to their Qualification bid. Thanks for the write-up. Wow, look how much KJ change from the Bahrain game to last night. His legs alone look like they double in size.